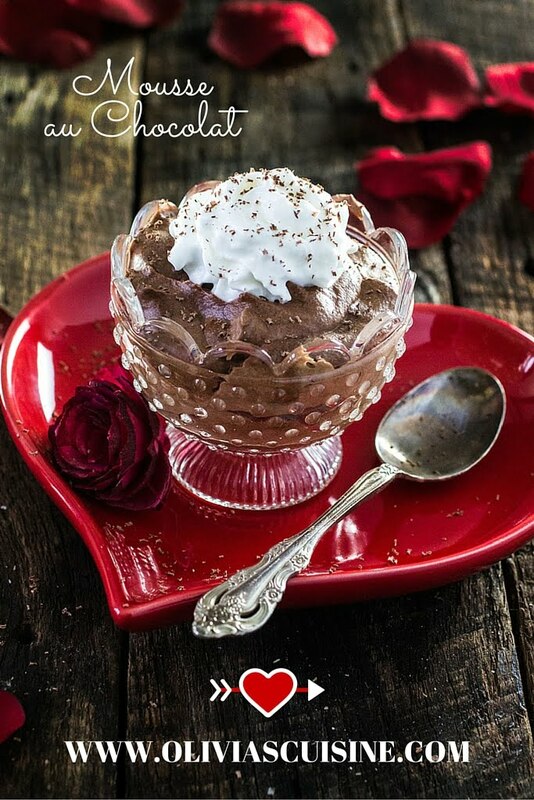 Nothing says romance like homemade Mousse au Chocolat! Especially when it’s an easy recipe with only 5 basic ingredients. Because who said you have to be in the kitchen all day to make something special? In fact, I have a few more easy recipes to share with you this week that will not only impress your Valentine, but also give you time to actually do your hair and make up. Tell me, when was the last time that happened? Just kidding. That is just me projecting MY life on you! I rarely have time for hair and make up. Usually, I have to pick one of the two. So either you’ll see me rocking a fabulous hairdo or wearing lipstick. Don’t expect both!??? 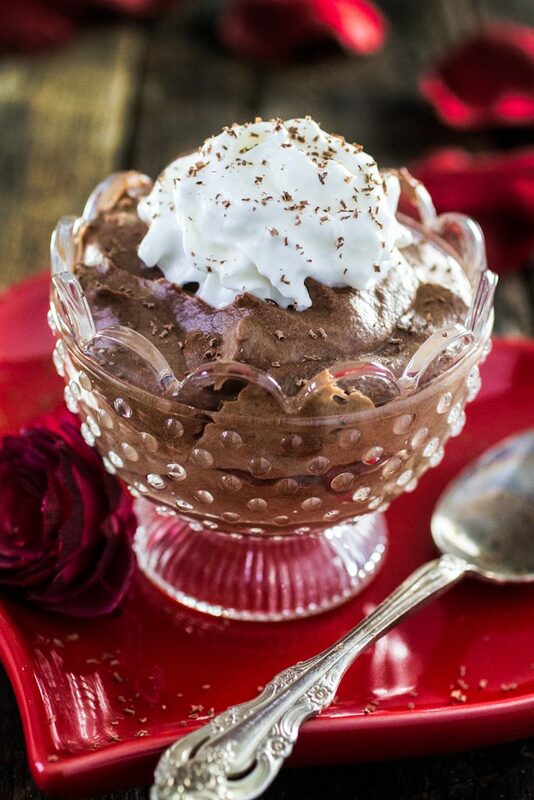 And because I’m always all over the place, I’m starting V Day week with dessert and sharing this decadent, creamy and silky Mousse au Chocolat. Which is just Chocolate Mousse in French! It just sounds better (and more romantic) in French, doesn’t it? I’m very particular about my Mousse au Chocolat, which is why it took me a while playing with this recipe until I was satisfied. For me, good chocolate mousse is rich, yes, but not dense. It is sweet, creamy and light as air. The type that almost melts on your tongue and has the just amount of chocolate-ness to it. Recipes that claim to be “authentic” say that you are only suppose to use chocolate and eggs, nothing more. Julia Child, on the other hand, uses a ton of butter (obviously! ), coffee and some other fancy ingredients. My recipe asks for only 5 ingredients: chocolate, egg yolks, a little milk, sugar and heavy cream. Plus a splash of booze for fun, which is optional. And because I use whipped cream for extra lightness, I use dark chocolate (60% cacao) so we don’t lose the strong chocolate flavor. Flavorings like orange, espresso, sea salt, cinnamon, and chili powder can be added to spice things up, if you so desire! Another trick for a lighter than air mousse is to let it stand at room temperature for 5 minutes before serving. The mousse goes in the fridge for at least 1 hour to set, but since I usually leave it there longer – sometimes overnight – I find that if I serve it right from the fridge, it will be denser than if I wait a few minutes for it to get creamy again. Some purists might go crazy if they read this, but I like to serve my chocolate mousse with whipped cream and chocolate shavings. But it’s up to you, really. With or without garnishes, this elegant Mousse au Chocolat will be the perfect ending to your romantic Valentine’s Day dinner. Using a hand mixer, cream the egg yolks and 1/3 cup of sugar until pale and fluffy. Reserve. In a saucepan, over medium heat, combine the milk and the remaining 1/3 cup of sugar. Once it begins to simmer and the sugar is dissolved, remove from heat and pour a small amount in the creamed yolks, whisking constantly so you don't end up with sweet scrambled eggs. Once the creamed yolks are tempered, add it to the saucepan and bring it back to the stove. Continue cooking, stirring constantly, until it thickens slightly and the custard coats the back of a spoon and a line drawn with your finger comes clean. Reserve. Melt the chocolate by placing it in a medium sized bowl and putting it in the microwave. Heat it on medium high for about 1 minute, then remove from the microwave and stir. Repeat heating at shorter intervals of 15 seconds, stirring in between, until the chocolate is completely melted and smooth. Alternatively, you can melt it in a double boiler on your stove. Combine the melted chocolate, the custard and the liquor, if using. Reserve. Using your hand (or stand) mixer, whip the heavy cream until soft peaks form. Add 1/3 of the whipped cream to the chocolate/custard batter and whisk by hand, vigorously, until combined. Then, gently fold in the remaining whipped cream, making sure not to deflate the mousse. Transfer the mousse to a large serving dish or individual glasses and refrigerate for at least one hour to set. Absolutely adorable! I am a chocoholic, so this recipe is definitely on my MUST TRY list. Pinned! I do love a perfect classic French style chocolate mousse, it is a regular, served for birthdays and celebrations. Everything sounds better in French and whipped cream and chocolate shavings is always a good decision! Looks like a perfect Valentine’s Day dessert! I hope you get your bling! This looks so good!!! I should definitely try it this Valentine’s day! I could dive into that with a spoon! It’s times like this when I wish I could just reach through the screen. This is definitely on my must-make list. I love your tip about letting the Mousse come up to room temp before serving! One of the restaurants I used to work had great cheesecake and I always would put a slice in my office a few hours before closing and then enjoy it while I was doing the closing books. It was soooo good but lots of people thought I was crazy! Now I want to go back and show them this post! LOL This Mousse is really beautiful. Happy Valentine’s Day! Hahaha! That’s such a coincidence, because I do the same with my cheesecake. If you check my cheesecake recipe here on my blog, you will see that I said I always serve at room temperature. It’s way better and creamier that way! :) Great minds think alike, huh? :) Thanks for stopping by! Wonderful recipe! I love chocolate! Just beautiful! So perfect for a wonderful dinner at home!